To Ski or to Snowboard? : Not sure which boot to try on? Let’s ask the experts. Now that winter is here, it’s time for the next round of snow-loving parents to teach their children, or maybe even themselves, how to ski or snowboard. But deciding which one to pursue can be a slippery decision. That’s why we spoke with John Brodie and Jessica Parr, two snow school managers at Snow Valley Ski Club, who can help clear a path. Over the decades, ski technology enjoyed a continual progression. But by the 1980s, it had reached its plateau. This was around the same time that snowboarding began to take off, and by the early 1990s, “snowboard technology started influencing ski technology,” Brodie says. From that point on, ski and snowboard brands began partnering up and adopting each other’s ideas. For example, snowboard manufacturers started incorporating the idea of skis edges into their boards, increasing the ability to perform sharp turns. In terms of cost, from a technological gear standpoint, neither sport is necessarily more expensive than the other. But you could see costs related to where you practice your sport. “I think it’s a different investment,” Parr says. If you’re someone who likes to spend a lot of time in the freestyle park—typically snowboarders—then you will most likely be satisfied with going to either Snow Valley or Rabbit Hill. However, if you’re more into downhill runs—typically skiers—you‘ll likely be spending big bucks on trips to the mountains. At Snow Valley, there are usually a lot more students in ski lessons than snowboarding lessons. Parr believes this is because snowboarding is still a relatively new sport. Most parents learned to ski when they were young, so that’s what they want their children to learn first. However, some do go directly into snowboarding lessons. In fact, we’re right on the cusp of seeing a new generation of parents who learned to snowboard first, which could mean an increase in young students taking snowboarding lessons out of the gate. Another reason could be the common misconception that skiing is safer than snowboarding. However, the truth of the matter is that both sports have equal amounts of risk—it’s the type of injuries that create a difference between these two sports. “A skier is more likely to injure their knee, and a snowboarder their wrist,” Brodie says. Knee injuries are very common with skiers because of “how the body initiates a turn, putting stress on the joints,” explains Parr. Wrist injuries are more common with snowboarders because when they catch and edge, causing a wipe out, there’s an instinct to put out your hands to break the fall. There’s also a sense that a person has more control on skis compared to a snowboard—at least when you’re first learning. “As a beginner, it’s easy to control your speed with the snowplow,” Parr notes. There is also an easier sense of balance on skis. 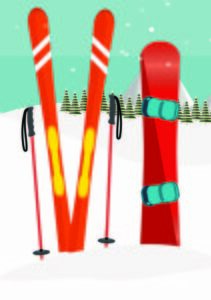 Instead of having both of your feet on one board, you have a ski on each foot, almost like you’re wearing skates. As Canadians, we don’t really have a choice but to learn how to skate from a very early age—even just walking down the sidewalk in winter constitutes an informal lesson. So by the time you start to ski, many find that it comes naturally. Another great benefit of learning to ski first is that it can feel like you’re making progress more frequently. “A student in ski lessons is seeing constant small increments of progression, whereas with snowboarding it’s momentous leaps,” Parr says. That said, snowboarding has its advantages. The first thing that snowboarders say is that it’s a different community. Snowboarding was introduced as an alternative to highly competitive ski racing, with more emphasis on freestyling and creativity. “The culture of snowboarding is a little more relaxed,” Parr says. Another advantage is that once you get the hang of it, “it becomes more of an extension of your body,” Brodie notes.